Prisha completed the intro robotics WeDo program. 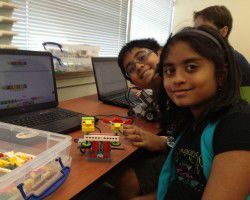 Following the WeDo robotics, Prisha successfully certified in the intro robotics NXT program where she programmed robots to follow basic commands such as curve and point turns, obstacle navigation, and using sensors.Click on this link and enter the following password to see some pictures of Prisha’s great work! Secure page password – has been emailed to Scienzminds parents.